Becky Mangus is Publisher of The Business Monthly and when we chatted she was in her last months as co-owner of the paper she ran for almost 17 years (she just sold the paper to Dan Medinger)! If that isn’t enough, she’s a very proud grandmother of 4 grandkids (one born this month! ), volunteers her time to Blossoms of Hope and hospice care organizations, is a dog-lover and makes a delicious kiwi, strawberry & pineapple tart. She loves visiting Nashville, TN and I loved visiting her in her light-filled family room (it has 18 windows). I know you will love hearing about how her treasures reflect her love of family and what she has planned for life post-paper! AFP: Your family room has so much great light! Tell me about the house and this great room with tons of light. BM: When we bought the house it ended right here at the beginning of the columns. When we decided to enlarge it, we sat down with a builder and an architect and between the two of them, my husband and I, we came up with the space you see now. One of the main things that I wanted was windows; if you'll notice there's 18 windows in this great room. AFP: You've got a great grouping of collectibles. Tell me more about them. BM: My style is eclectic. My mother was really into Hershey’s. So when she would come out to visit from Colorado, we would go up to Hershey, PA and she'd buy a whole bunch of Hershey items. 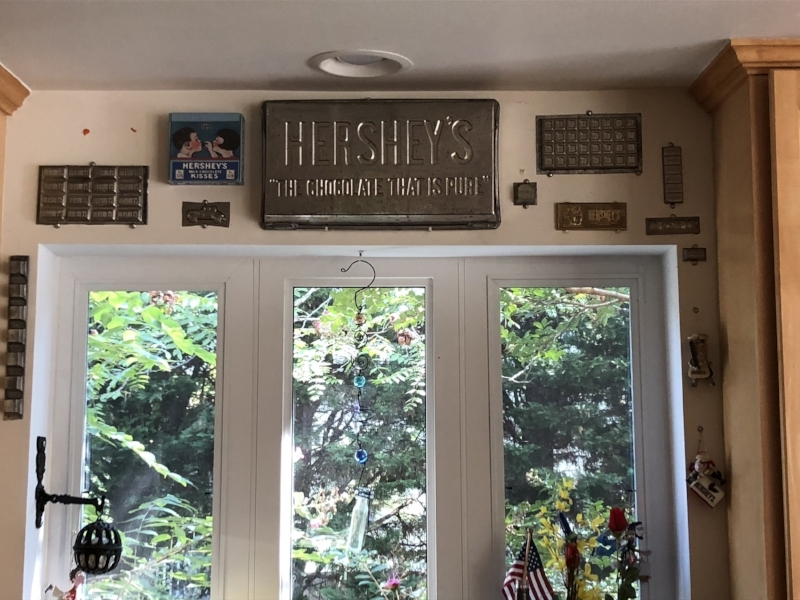 When she passed, my sister and I divided the Hershey items and there are 2 cooking molds over there. And I thought that was a great place to display. AFP: They are beautiful to display! BM: I also have a little whimsical things. My grandparents had those trains and carts and horses. I really love bright displays. I love materials and papers; I had found a book that had those labels in them, so I used them for a backsplash and you can see that carried throughout. AFP: I love it. You've got a nice collection. BM: And this is my father, he was in World War II. When he passed I got his uniform and some friends were over and we, just joking, said, "Wouldn't it be great to put it on mannequin?" And I said, "You know what? I have one from a trade show!" And so we put the uniform on it. Then we thought, "Wouldn't it be fun if we have his face on there?" So I got his picture and blew it up. AFP: I don't think I've ever seen something like that. My grandfather was in World War II. I love your dog statue next to the door. BM: That's the kind of dog we used to have, that's Layla II. We looked all over because these kinds of dogs have different faces on them. We looked around at quite a few dogs to find the right face. AFP: And what is the breed? AFP: How long have you guys been in this house? AFP: What drew you to the house? It's not part of a neighborhood necessarily, but it's setback very nicely. BM: When we moved in here, none of these houses were here. We we wanted at least an acre of land. Had to have space for an office, and of course enough bedrooms for all of us. AFP: And you clearly must like to cook, because you have nice kitchen. BM: Entertain and cook. We do a lot of entertaining. Most of the family get-togethers are done here. As a matter of fact this Sunday coming up, my son and daughter-in-law are expecting their second child in just a few weeks, and she wanted just a family get-together. I've had 50 people here for a sit down dinner. We move the furniture, the couches and the chairs. Then, we put four round tables here and we extended the dining table, and we fit 50 people seated! AFP: That's great! I can imagine how that would work out and it's so open, everyone can connect. I love the way you've created two rooms here with the placement of furniture. It’s a really smart way to do it, and like you said, as you need to change the dynamic you just move things and open it up. BM: It really makes it nice, because this is a really nice formal kind of space. It's perfect for sitting and talking and chatting with guests. And the Christmas tree usually goes in front of the window. So when all the kids come over, which we're growing now soon having four grandchildren under the age of four, we sit around here and open our gifts. AFP: What a great space. Really, from every angle you get a great view of something that you love and means something to you. So you have so many great things just in this room. Do you have like a most treasured piece out of everything you've shown me? BM: Probably my secretary just because it's so old, and I remember going to my grandparents house and seeing it. She had a wonderful eye, she could have been an interior decorator. Another treasured item is this walking stick a friend of mine made. I'm a shaman. One of the women I met during my course found this stick, and for some reason she thought of me and she made this. AFP: It's gorgeous. So you entertain a lot. Whether you are either entertaining or just cooking at home with your husband, what's your favorite thing to cook. Or does your husband do a lot of the cooking? BM: Actually, we both do. He'll grill a lot. I have a lot of special appetizers, like artichoke heart squares. We make them with cheese and artichoke, and you bake it. And I make a mean deviled egg; mine are sweet as opposed mustardy. And my mashed potatoes are well liked. I make a tart, a fruit tart, that's really very good. We go to our friends' for Thanksgiving and there's actually anywhere from 30 to 40 people there every year, and even her children say, "Becky has to bring the tart." AFP: What's your favorite type of tart? Any kind of fruit? BM: It's kiwi, strawberries and pineapple. AFP: Sounds delicious! I know your office is at home, does that change how you feel about the house? How you interact with the house? I also work from home, so I know there's a different dynamic. BM: No, I think it's important to have a room that is specifically your office. Not an office in a bedroom or office in something else. It's really important because when I walk into that room, really, I go across the threshold and I'm at work. I leave the threshold and I'm not at work. A lot of times I work till 3 o'clock in the morning and it's really nice to be able to not have to drive home. AFP: I feel the same way and have the same situation. I don't know that everyone works that same way, but I've been able to do that, too. It's one room, that’s just my office. AFP: You said that your grandkids are here part of the week? BM: Fridays! They are here every Friday. AFP: You raised kids here and now your grandkids come here at times, and you have an office here. So, when I think about this big phrase of "aspirational living,” what you aspire for your home and your life, what do you think over the next 10 or 15 years sort of your aspirations are for the home and living in your home? And how you see it supporting you? BM: Family is very important to me as I think you've probably picked up, not to mention all the pictures all over, and the fact that Fridays is “grandchild day.” It's really important for family to feel welcome here and that this is their home. My husband and I've been talking about this, actually, because we're nearing the stage where it's time to think about what the second career is, we just sold the newspaper. So after that I will still pursue something, I'm just not sure what it is exactly. I will do a lot more my spiritual work. AFP: That's really exciting. This is huge news! It's interesting, because literally the next question is, “if you were not the owner of The Business Monthly, what job would you like to have?” And it's not written to the sense of you're now leaving that job and what's next, but some people think, "Well if I wasn't doing this..." or "What if I could be?" So that's really interesting that you are on the verge of figuring that out. BM: I'm working on that. I pretty much know the next 5 or 6 months. The next 3 months I am helping transition. I'm also going to Florida to help my mother-in-law move. And then of course, there's the holidays, which is big for me. I'm a big, big Christmas person. Then of course, the kids. We do a cookie exchange, where I have to make about 20 dozen cookies. And that's the beginning of December. AFP: You've got the year taken care of! BM: I know for a fact that I will be doing a lot more intuitive development, and spiritual development. I don't really anticipate that becoming a money thing. Although, one never knows where that's going. I am a healer and just developing that more. So we'll see where that goes. AFP: Congratulations! We'll still be hearing your name around the community, I'm sure. BM: It really is kind of a exciting, because it's like I'm choosing now what I'm going to do. I no longer have to do something because I should for The Business Monthly, or I should for the kids. Everything now is a conscious decision and I'm doing it because I want to do it. AFP: So in looking back, what is your proudest work accomplishment? BM: I would say putting out a really good product for almost 17 years with the paper. I was a journalism major during the Woodward and Bernstein era, so traditional reporting is what I do. Less of the fluff and more of “lets get into the story.” So I really felt that that was the product that we produced for the community. When I took it over, I didn't know where it was going to go and I certainly didn't expect to receive a lot of awards. It's wonderful to receive awards, but as I think most people would tell you, the award isn't what you're going for. I will admit there was one last award that I wanted, kind of like the cherry on top, and I got; the Howard County Women's Hall of Fame. So I didn't really expect to be recognized in the community, I didn't expect to be so involved in the community and hopefully influential and helpful. But when I took over the paper, that was part of it. I really enjoyed it, the contacts and people I met. I gotta tell you there are so many good, talented, exciting people in the world. AFP: I hear it time and time again, too— it’s all about the relationships. It's interesting that I'm catching you reflecting back a little as you're reflecting forwards. I know you are involved with a lot of activities in the community, and now that you're making this shift I suppose you don't know where those efforts will go after some of your commitments are finished. Do you have a cause or organization you're thinking of working with? BM: There's a few boards that I'm still on that I will continue. Blossoms of Hope is something that I've been with since the beginning and it has a special place in my heart. Hospices are something that I hold dear to my heart. I can't think of an organization that does what it's supposed to do more than hospice. You know, it really sticks true to its purpose and that purpose is very critical. We had them in the last week with my mom. Those are two that kind of hold a special place. AFP: Who has been a mentor to you? BM: Two people that I really admire and hold in high esteem are Jean Moon and Mary Ann Scully. Both are friends of mine. AFP: How you spend your free time? BM: I've been doing some spiritual-intuitive ventures and I've been doing some classes and and meetings. One of the things that my husband and I are going to start doing is traveling. You know the old steam trains? We've got one in Virginia and one here in Maryland. I think we're going to try to start going on a little, short day trips. AFP: What is your favorite vacation spot? AFP: What is it about Nashville that you like? BM: We've been there about 3 times. I love the Grand Ole Opry, both the new and the old, we've been to both of them. What we really like to do is go to the honky tonks and sit there and listen to the music and have some drinks and food. AFP: Now I have some fun questions. Coffee or tea? Tea. Iced tea, all day long. Netflix or a movie theater? Theater. Summer or winter? I guess, summer. I don't like the heat of the summer, but I liked the carefree of the summer. Online shopping or shopping in person? In person. Favorite restaurant? Tino's Italian Bistro. If you could live in a different state or country, where might it be? Denver. AFP: That was my last question. Thanks so much. I appreciate your time! I love a collection with a story and Becky has many to share! When your home tells your story through objects it makes for a home that really reflects you. I find that when people surround themselves with things they love they have a very welcoming home. Becky, thanks for welcoming me into your home and sharing your stories with me and my readers!